Make the most of your outdoor space and reduce home cooling costs. Reduce sun glare and control indoor head game. Increase the use of your outdoor living space. Add character to your home. Choose from a wide variety of colours, designs and patterns available in 100% spin-dyed polyacrylic fabric. Arms and casing available in white or grey powder coating. Projection up to 13' 1" with widths from 8' to 40'. Electric motor - concealed tubular motor; maintenance free; will extend or retract awning with a touch of a button. 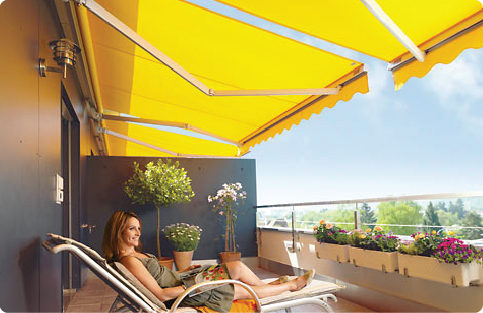 Sun and wind sensors to operate your awning automatically according to weather conditions. Drop Valance to provide more shade and privacy. Extruded aluminium hood to protect your awning fabric from the elements. 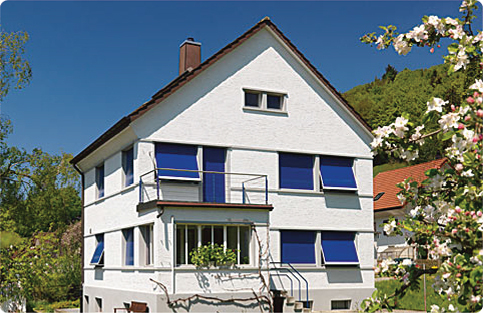 Retractable awnings are most commonly mounted to the fascia board just below the roof line. Lag bolts are used to anchor the awning to the stud beams. When the fascia mount isn't suitable the next most common place for mounting is the roof. Special mounting brackets and lag bolts are used to anchor the awning to the ceiling trusses and then the area is sealed for waterproofing.